Storage VMotion technology has been around for a long time. Those of us that have been around the industry for a while even remember how its original release was actually done via command line. If memory serves, someone even pre-developed the first UI plugin for it before VMware made it a main stream feature. Since then other features like Storage DRS came along that leveraged the underlying functionality. In the beginning it was an awesome feature to move things around. It solved a lot of problems for administrators to shuffle workloads around on traditional LUN based storage as capacity was needed, but as virtual machines have become larger the whole Storage VMotion process has not evolved much in the sense of performance. Those migrations take a long time to complete. I’m extremely excited about the new feature announced by Tintri to help evolve this. Tintri is officially calling it VM Scale Out. Here’s how it works. Are both LUN’s presented to both hosts or is this a storage replacement operation to net new targets? In some cases the copy may revert to network copy to complete the operation which is a worst case scenario that would take the longest. So the question is, what if we could perform the copy operation between arrays, at the virtual individual machine level, using the native replication technology of the array? Well guess what, that’s what Tintri VM Scale Out does. It starts first with Tintri Global Center and setting up a Storage Pool. This is essentially Tintri’s version of Storage DRS. If you want to learn more about storage pools in TGC I can write-up something later. Essentially a pool is a group of Tintri VMstore arrays that work together to make recommendations about capacity AND performance about the various machines running on them. The recommendations are extremely detailed and if you have not seen it, you want to get a demo. Once you have this setup recommendations will be made that you can choose to execute or ignore. If you decide to execute it (today) it would invoke a storage VMotion to make the move happen. This is because Tintri VMstores are tightly integrated into vSphere. However, with the NEW Tintri VM Scale Out, the process is MUCH more efficient! By leveraging the native Tintri replication the data migration process will happen extremely fast. Essentially at the end of the process we will notify vSphere that the machine has been Storage VMotioned as normal but really we did all the work first, then told the hypervisor. It’s pretty clear based on how this will work what the key take aways are but to quote a Tintri Blog post, here are some of the main points. With traditional storage live migration, a.k.a. VMware Storage vMotion, storage migration is highly inefficient, taking hours to plan and migrate. 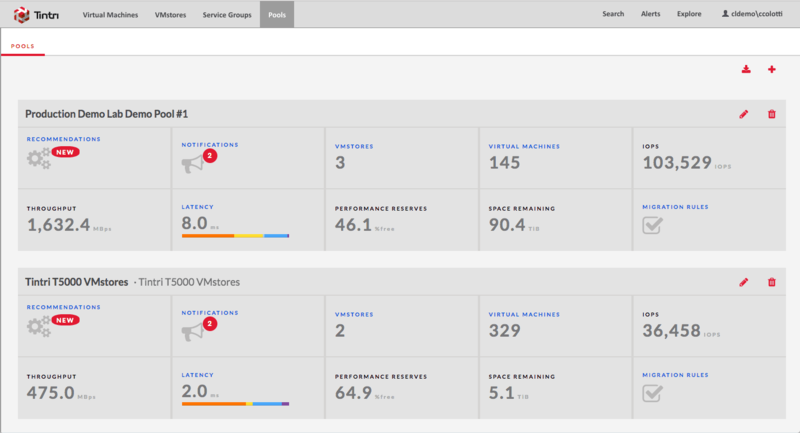 Tintri VM Scale-Out provides Tintri users with recommended actions and exact outcomes. All users have to do is hit “execute” to complete those actions. With this release, you can use Tintri array offloading of storage live migration for both vSphere and Hyper-V. The other thing to mention is all this is being done on the array AT the virtual machine level. This is because Tintri is truly the only VM-Aware storage system and all operations are done per virtual machine, never at the LUN or Volume level. If you are going to VMworld, you want to go to the booth and talk to someone about this and some of the other cool announcements I will talk about in a day or so.